Mars has two moons. The planet isn't very big, so these are tiny things. It's been suggested that they're not much more than captured asteroids; they don't look like much more than that. Asaph Hall discovered Phobos--along with Deimos, Mars' other moon--at the United States Naval Observatory using their 26-inch refractor, the most powerful telescope in the world at the time. Because he was the first guy to find Mars' moons, he was the first guy to discover Mars' mass. This is because the mass of an object determines how strong its gravitational pull is; gravitational pull determines how fast an object moves around a larger one. Scientists still use this technique to measure the mass of objects with deep space probes and groups of stars--as the object pulls on the probe or companion star, it moves differently. The change in motion--the acceleration--created by the object tells us the mass. There's a big hole in Phobos--a crater that covers a large area of Phobos' surface--called Stickney. It's named for Asaph Hall's wife who apparently encouraged him in his search for satellites around Mars. The crater itself wasn't named until imaged by Mariner 9. 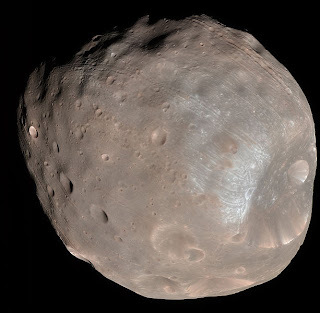 A few of Phobos' properties make it particularly unique. It is very porous. Some astronomers long ago suspected that it was hollow--perhaps built by Martians to protect them from radiation--but this has since been discredited. It wasn't a terrible hypothesis at the time. The idea that there such things as Martians was popular. It's also incredibly close to the planet--moving from rise to set in four-and-a-half. Phobos is, however, slowly falling into Mars. Due to atmospheric drag, its orbit decays, spiraling over millions of years into the planet. This yields two possibilities. Phobos may fall directly into Mars in eleven million years, or it may break-up to form a ring in around seven million, the remaining pieces pelting the planet for millions of years after. Phobos may prove useful in the future. Considering how close it is to Mars and how small the moon itself is, it may make a good substation for astronauts trying to land on Mars or return to Earth. It may also be the gateway to hell. 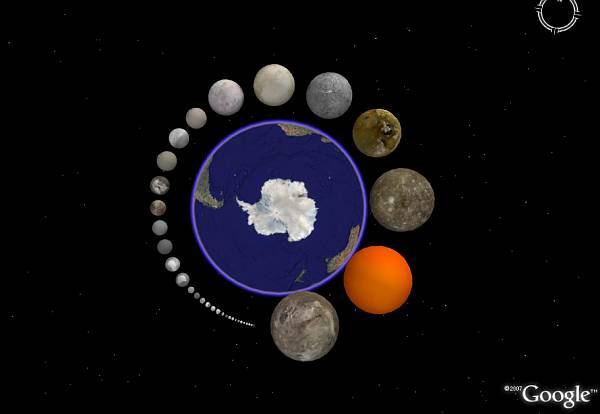 There’s a lot of moons in the solar system--172 to be exact. We don’t know much about most of them. Sitting around watching the Science channel, I thought it would be cool to write little bits about each of them and what makes them interesting, publishing one every month. I’ve selected a handful of the ones we know a little more about and will write them in the coming months. I will also continue to write regular posts. I always write them while I'm in the mood to do so, which is why they get posted so irregularly. In a way, moons are a lot more exciting than planets. With a suit to keep us warm, pressurized, and breathing, all of them are places we could stand on, unlike most of the planets. Only half of the planets have tangible surfaces, and only half of those are cool enough to stand on. The rest are either too hot or too soft. With 172 moons, there’s a lot more to stand on and to explore. All of the moons are solid bodies. Deep space probes are likely on par with humans when it comes to analysing gas giants, but solid bodies will be better studied when touched, when rocks can be turned over, and when a human can choose where to look and poke without delay. In this series of articles, I’ll talk about some of these bodies, but I can’t talk about all of them. We haven’t poked around enough. It would be nice to think that we would explore more moons as I write about them, but apathy and expense have made space exploration painfully slow. Despite what we know, our base of knowledge about the destinations of our posterity is painfully thin but curiously tantalizing. The solar system is like the show “Lost;” the more we learn, the more questions we uncover. In science, though, there doesn’t have to be a vague conclusion in four years. We can explore forever. I'll be posting the first moon in a few days and one per month after that. I have 14 moons in queue, though I may reduce or increase the number if we learn more or know less than I think we do. I also might burn out after a month or two. I've only done one other series, and I got sick of doing it.